~~> Paint Sparkles is back -- and this time it's princess style! ~~> Create with awesome royal colors & tools: Shake your device and see paint-filled fireworks rocket off! ~~> More than 120 gorgeous & exciting princesses coloring pages! Customize the colors and use your creativity! Have all the coloring and painting fun you wanted while you decorate beautiful princesses with a stunning array of colors and graphics! 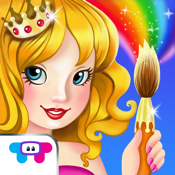 Have a blast when you paint each pretty princess however you like! It’s a whole world of creativity, coloring, and rad royals-- there is so much fun to be had! > Tap to select a princess to color! > Drag to color in princesses on different coloring pages! > Shake to create an explosion of color and creativity! > Select different colors and tools from a wide selection! With over 400 million downloads and growing, TabTale has established itself as the creator of pioneering virtual adventures that kids and parents love. We lovingly produce interactive e-books, games, and educational experiences for children.